How to reduce sodium intake is a question in many minds. You need not to suddenly eliminate foods from your diet. Rather, to moderate your sodium intake, choose lower-sodium foods from each food group more often and balance high-salt food choices with low-sodium ones. In order to reduce sodium intake, it is also important to pay attention to the sodium values listed on food labels, and taste foods before adding salt. In addition, when eating out, avoid foods commonly prepared with lots of salt. Ask to have sauces served on the side and then use only small amounts. It is actually not that hard to eventually adapt to a low-sodium diet. At first, foods will taste quite bland, but eventually you will perceive more flavor as the tongue becomes more sensitive to the salt content of foods. By slowly reducing sodium intake and substituting oregano, lemon juice, and other herbs and spices, you can eventually become accustomed to a diet that contains only 2.4 grams of sodium daily but does not result in much of a flavor trade-off. Do you sometimes crave and hear concerns about sodium and its primary dietary source, table salt? Some of this concern is warranted, but is an essential part of a diet. The human body absorbs almost all salt that gets eaten. This sodium then becomes the major positive ion in extracellular fluid and a key factor for retaining body water. Fluid balance through out the body depends partly on varied sodium and other ion concentrations among the water – containing compartments in the body. Sodium ions also function in nerve impulse conduction and absorption of some nutrients (e.g. glucose). A low-sodium diet- coupled with excessive perspiration, persistent vomiting, or diarrhea-has the ability to deplete the body of sodium. This state can lead to muscle cramps, nausea, vomiting, dizziness and later shock and coma. The likelihood of this happening, however, is low because early kidney responses to low sodium status eventually trigger the body to conserve salt. 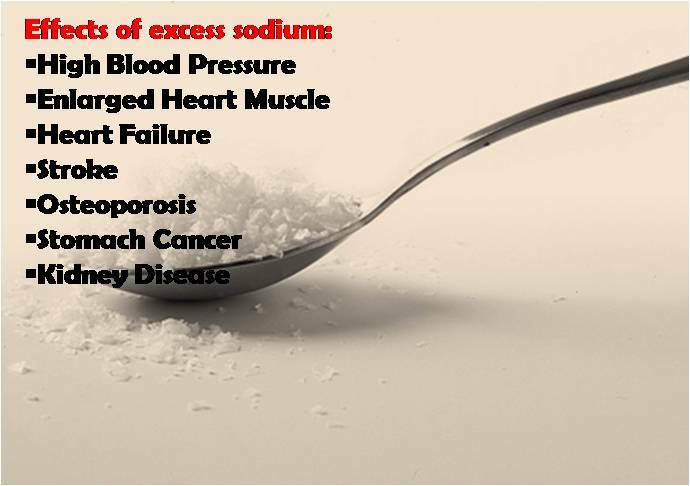 In addition, people generally eat a lot of sodium. Body conservation of sodium demonstrates how important small amounts are to body functions. Only when weight loss from perspiration exceeds 2% to 3% of total body weight (or about 5 to 6 pounds) should sodium losses raise concern. Even then, merely salting foods is sufficient to restore body sodium for most people. Endurance athletes, however, may need to consume sports drinks during competition to avoid depletion of sodium. Not also that although perspiration tastes salty on the skin, sodium is not highly concentrated in perspiration. Rather, water evaporating from the skin leaves concentrated sodium behind. Perspiration contains about two-thirds the sodium concentration found in blood. Almost all foods naturally contain sodium; the higher amount found in milk (about 20 milligrams per cup) is one exception. The more processed food one consumes, generally the higher sodium intake. Equally, the more home cooking one does, the more sodium control that person has. About one -third to one -half the sodium we consume is added during cooking or at the table. Most of the rest is added during food manufacturing. Many health authorities are calling for manufacturers to use less sodium so that our total sodium intakes fall. To some extent this is taking place (for example, low sodium soups and crackers). Major contributor of sodium in the adult diet are white bread and rolls, hot dogs and lunch meats, cheese soups, and foods with tomato sauces, partly because these foods are eaten so often. Other foods that generally are especially high in sodium include salted snack foods, French fries, potato chips, sauces and gravies. If we ate only unprocessed foods and added no salt, we would consume about 500 milligrams of sodium per day. This is also the recommended minimum sodium requirement for adults. Even this is a generous amount, considering, that we really need only about 100 to 200 milligrams a day. If we compare 500 milligrams of sodium from unprocessed food with the 4000 to 7000 milligrams or more typically eaten by adults, it is clear that food processing and cooking contribute most of our dietary sodium.